Bactria (or Bactriana, from Greek ; Bākhtar; Chinese , later Tukharistan, Tokharistan, Tocharistan) was the ancient name of a historical region in Central Asia, located between the range of the Hindu Kush and the Amu Darya (Oxus ). It was a part of the northeastern periphery of the Iranian world, now part of Afghanistan , Tajikistan , Uzbekistan , and, as a smaller part, Turkmenistan . The region was demarcated by widespread practice of proto-Aryan religions like Zoroastrianism and Buddhism. Goddesses, Bactria, Afghanistan, 2000–1800 BCE. The Bactria-Margiana Archaeological Complex (BMAC, also known as the "Oxus civilization") is the modern archaeological designation for a Bronze Age culture of Central Asia, dated to ca. 2200–1700 BCE, located in present day Turkmenistan , northern Afghanistan, southern Uzbekistan and western Tajikistan , centered on the upper Amu Darya (Oxus), in area covering ancient Bactria. Its sites were discovered and named by the Soviet archaeologist Viktor Sarianidi (1976). Bactria was the Greek name for the area of Bactra (modern Balkh ), in what is now northern Afghanistan, and Margiana was the Greek name for the Persian satrapy of Margu , the capital of which was Merv , in today's Turkmenistan. According to some writers, Bactria was the homeland of Indo-European tribes who moved south-west into Iran and into North-Western India around 2500–2000 BCE. Later, it became the north province of the Persian Empire in Central Asia. It was in these regions, where the fertile soil of the mountainous country is surrounded by the Turanian desert, that the prophet Zoroaster (Zarathushtra) was said to have been born and gained his first adherents. Avestan, the language of the oldest portions of the Zoroastrian Avesta, was one of the old Iranian languages, and is the oldest attested member of the Eastern Iranian branch of the Iranian language family. Bactria has belonged to Iranian empires since a very early stage, in fact it is suggested by E. Herzfeld that Bactria belonged to the Median empire. And it was annexed to the Persian Empire by Cyrus the Great in 6th century BCE and together with Margiana it formed the twelfth satrapy of Persians. After Darius III of Persia had been defeated by Alexander the Great and killed in the ensuing chaos, his murderer Bessus, the satrap of Bactria, tried to organize a national resistance based on his satrapie but was captured by other warlords and delivered to Alexander. He was then tortured and killed. Alexander conquered Sogdiana and Iran . However, in the south, beyond the Oxus, he met strong resistance. After two years of war Bactria became a province of the Macedonian empire, but Alexander never successfully subdued the people. After Alexander's death, the Macedonian empire was eventually divided up between generals in Alexander's army. Bactria became a part of the Seleucid Empire, named after its founder, Seleucus I. The Macedonians (and especially Seleucus I, and his son Antiochus I), established the Seleucid Empire, and founded a great many Greek towns in eastern Iran , and the Greek language became dominant for some time there. 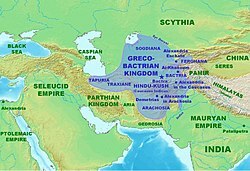 The paradox that Greek presence was more prominent in Bactria than in areas far closer to Greece can possibly be explained by the supposed policy of Persian kings to deport unreliable Greeks to this the most remote province of their huge empire. "The famed Bactrian Empire of a thousand cities, wallowing in wealth (opulentissimum illud mille urbium Bactrianum imperium)"
The many difficulties against which the Seleucid kings had to fight and the attacks of Ptolemy II of Egypt, gave Diodotus, satrap of Bactria, the opportunity to declare independence (about 255 BCE) and conquer Sogdiana. He was the founder of the Greco-Bactrian Kingdom. Diodotus and his successors were able to maintain themselves against the attacks of the Seleucids—particularly from Antiochus III the Great, who was ultimately defeated by the Romans (190 BCE). "As for Bactria, a part of it lies alongside Aria towards the north, though most of it lies above Aria and to the east of it. And much of it produces everything except oil. The Greeks who caused Bactria to revolt grew so powerful on account of the fertility of the country that they became masters, not only of Bactria and beyond, but also of India, as Apollodorus of Artemita says: and more tribes were subdued by them than by Alexander...."
The Greco-Bactrians used Greek language for administrative purposes, and the local Bactrian language was also Hellenized, as suggested by its adoption of the Greek alphabet, and the Greek loanwords. In turn, some of these words were also borrowed by modern Pashto. The Bactrian king Euthydemus and his son Demetrius crossed the Hindu Kush and began the conquest of Northern Afghanistan and the Indus valley. For a short time, they wielded great power: a great Greek empire seemed to have arisen far in the East. But this empire was torn by internal dissensions and continual usurpations. When Demetrius advanced far into India one of his generals, Eucratides, made himself king of Bactria, and soon in every province there arose new usurpers, who proclaimed themselves kings and fought one against the other. Most of them we know only by their coins, a great many of which are found in Afghanistan, Pakistan and India. By these wars, the dominant position of the Greeks was undermined even more quickly than would otherwise have been the case. After Demetrius and Eucratides, the kings abandoned the Attic standard of coinage and introduced a native standard, no doubt to gain support from outside the Greek minority. In India, this went even further. The Indo-Greek king Menander I (known as Milinda in India), recognized as a great conqueror, converted to Buddhism. His successors managed to cling to power until the last known Indo-Greek ruler, a king named Strato II, who ruled in the Punjab region until around 55 BCE. Other sources, however, place the end of Strato II's reign as late as 10 CE. The weakness of the Greco-Bactrian empire was shown by its sudden and complete overthrow, first by the Sakas, and then by the Yuezhi (who later became known as Kushans), who had conquered Bactria by the time of the visit of the Chinese envoy Zhang Qian (circa 127 BCE), who had been sent by the Han emperor to investigate lands to the west of China. Kujula Kadphises, the Guishuang xihou (or prince) of the Da Yuezhi, united the region in the early 1st century and laid the foundations for the powerful, but short-lived, Kushan Empire (1st to 3rd century CE), which was then overcome by the Sassanians from Persia. The name Daxia appears in Chinese from the 3rd century BCE to designate a mythical kingdom to the West, possibly a consequence of the first contacts with the expansion of the Greco-Bactrian Kingdom, and then is used by the explorer Zhang Qian in 126 BCE to designate Bactria. The reports of Zhang Qian were put in writing in the Shiji ("Records of the Grand Historian") by Sima Qian in the 1st century BCE. They describe an important urban civilization of about one million people, living in walled cities under small city kings or magistrates. Daxia was an affluent country with rich markets, trading in an incredible variety of objects, coming as far as Southern China. By the time Zhang Qian visited Daxia, there was no longer a major king, and the Bactrian were suzerains to the nomadic Yuezhi, who were settled to the north of their territory beyond the Oxus (Amu Darya). Overall Zhang Qian depicted a rather sophisticated but demoralized people who were afraid of war. "The Son of Heaven on hearing all this reasoned thus: Ferghana (Dayuan) and the possessions of Bactria (Daxia) and Parthia (Anxi) are large countries, full of rare things, with a population living in fixed abodes and given to occupations somewhat identical with those of the Chinese people, but with weak armies, and placing great value on the rich produce of China" (Hanshu, Former Han History). Following the settlement of the Yuezhi (described in the West as "Tocharians"), the general area of Bactria came to be called Tokharistan. The territory of Tokharistan was identical with Kushan Bactria, including the areas of Surkhandarya, Southern Tajikistan and Northern Afghanistan. The first literary mentions of Tokharistan appear at the end of the 4th century in Chinese Buddhist sources (the Vibhasa-sastra). However, the first mention of the Tocharians appear much sooner, in the 1st century BCE, when Strabo mentions that "the Tokharians, together with the Assianis, Passianis and Sakaraulis, took part in the destruction of the Greco-Bactrian kingdom" in the second half of the 2nd century BCE. Ptolemy also mentions a large Tokharian tribe in Bactria, describing the central role of the Tokharians among other tribes in Bactria. From the 1st century CE to the 3rd century CE, Tokharistan was under the rule of the Kushans. They were followed by Sassanides (Indo-Sassanids). Later, in the 5th century, it was controlled by the Xionites and the Hephthalites. In the 7th century, after a brief rule under the Turkish Khaganats, it was conquered by the Arabs and then the Mongols and much later, by the Russians. The Bactrians are among the ancestors of modern-day Tajiks, Pashtuns, Pamiris, and Uzbeks. The Tajiks are the direct descendants of the Iranian peoples whose continuous presence in Central Asia and northern Afghanistan is attested from the middle of the 1st millennium bc. The ancestors of the Tajiks constituted the core of the ancient population of Khwārezm (Khorezm) and Bactria, which formed part of Transoxania (Sogdiana). P. Leriche, "Bactria, Pre-Islamic period." Encyclopaedia Iranica, Vol. 3, 1998. Library of Congress, "Tajikistan - Historical & Ethnic Background", ( LINK): "Contemporary Tajiks are the descendants of ancient Eastern Iranian inhabitants of Central Asia, in particular the Soghdians and the Bactrians, and possibly other groups, with an admixture of Western Iranian Persians and non-Iranian peoples." Schmitt, Rüdiger: Sprachzeugnisse alt- und mittel iranischer Sprachen aus Afghanistan, in: Indogermanica et Caucasica. Festschrift für Karl Horst Schmidt, Berlin/New York 1994, 168-196. Bernard, Paul (1994). "The Greek Kingdoms of Central Asia." In: History of civilizations of Central Asia, Volume II. The development of sedentary and nomadic civilizations: 700 B.C. to A.D. 250, pp. 99-129. Harmatta, János, ed., 1994. Paris: UNESCO Publishing. Beal, Samuel (trans.). The Life of Hiuen-Tsiang by the Shaman Hwui Li, with an Introduction containing an account of the Works of I-Tsing. London, 1911. Reprint: New Delhi : Munshiram Manoharlal, 1973. Holt, Frank Lee. (1999). Thundering Zeus: The Making of Hellenistic Bactria. Berkeley: University of California Press. (hardcover, ISBN 0520211405). Tremblay, Xavier (2007) "The Spread of Buddhism in Serindia ― Buddhism among Iranians, Tocharians and Turks before the 13th century." Xavier Tremblay. In: The Spread of Buddhism. (2007). Edited by Ann Heirman and Stephan Peter Bumbacher. Handbook of Oriental Studies. Section Eight, Central Asia. Edited by Denis Sinor and Nicola Di Cosmo. Brill, Lieden; Boston. pp. 75-129.